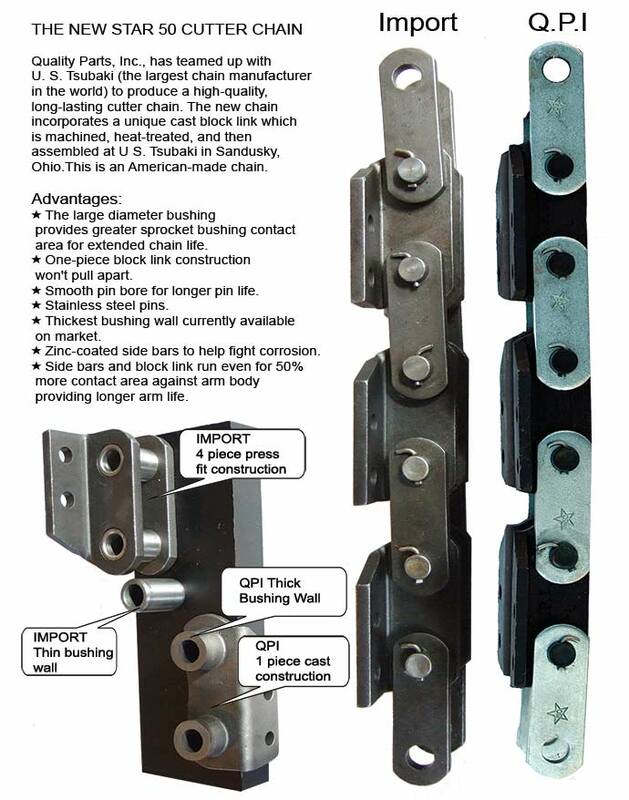 Cutter Chains Quality Parts Inc.
Quality Parts, Inc., has teamed up with U. S. Tsubaki (the largest chain manufacturer in the world) to produce a high-quality, long-lasting cutter chain. The new cutter chain incorporates a unique cast block link which is machined, heat-treated, and assembled at U S. Tsubaki in Sandusky, Ohio. This is an American-made cutter chain. ★The large diameter bushing provides greater sprocket bushing contact area for extended chain life. ★One-piece block link construction won't pull apart. ★Smooth pin bore for longer pin life. ★Thickest bushing wall currently available on market. ★Zinc-coated side bars to help fight corrosion. ★Side bars and block link run even for 50% more contact area against arm body providing longer arm life. Cast was chosen for this chain because of it’s great wear characteristics. Think of an engine block. How many cycles does a piston with hard rings make up and down inside the bore without wearing out the cylinder wall? The engine block is not even heat treated, the chain link is providing a much longer service life.